Do You Need a House Call? Concierge Medical House Calls in Manhattan by a dedicated physician board certified in Palliative Medicine. "Making House Calls a Part of Life"
I make house calls in New York City and beyond, providing meticulous long term and short term medical care for patients with a variety of illnesses and conditions. For established patients I am available 24/7 for calls, emails or visits. Doctor house calls save costly and unnecessary ambulance trips, emergency room visits, hospitalizations, and premature nursing home placement. I work closely with home health nurses, medical equipment companies, pharmacies - and many other health professionals - to assure that all your medical care is coordinated and timely. I have been making house calls since 2007 and bring years of practical experience to every visit. "Dr. Barton's compassion and holistic view of the patient made this a sacred journey which we will all remember with gratitude." "Dr. Barton was available at all hours and came when we needed her." "Precisely what my Father, age 90, and I were looking for." "Like having wind under your wings." "Dr. Barton was a God-send. She enabled my mother to again have a good quality of life. I will forever be in Dr. Barton’s debt for giving my mother back to me." 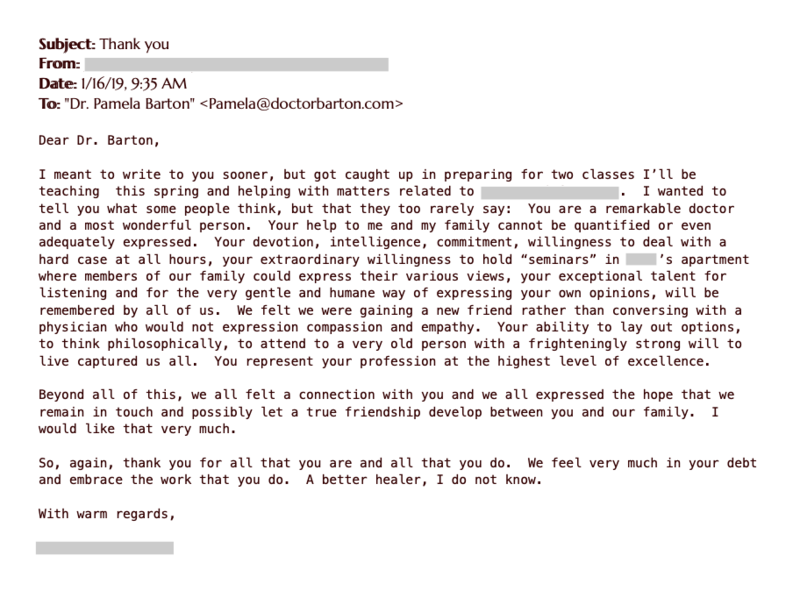 "Dr. Barton’s intelligent and loving presence was a great comfort." "I was delighted and greatly relieved to hear about Doctor Pamela Barton, 'The Visiting Doctor.'" "Dr. Barton’s help was immeasurable—not enough words suffice. She is/was one of my heroes. I will be forever grateful." If you can't get to the doctor's office, the doctor - and more - can come to you. I arrange for necessary tests, including lab work, ultrasounds, and even x-rays to be done in the home. Perhaps you have just been discharged from the hospital or have received a difficult diagnosis. I will help you navigate this new territory and make sure you get optimal care. Trained in Family Medicine and in palliative care, I support patients and families facing challenging medical conditions, whether you’re getting back on your feet or coping with decline. I provide expert symptom management, timely assessments, and focused treatment of problems large and small. My care comforts the patient and eases the burden on family and other caregivers. I am truly responsive to everyone's need for privacy, dignity and kindness. I manage a wide range of problems in the frail patient - from general adult internal medicine, including geriatrics, to the management of worrisome symptoms in a patient of any age – such as chronic pain, insomnia, or nausea. I treat a variety of conditions such as Amyotropic Lateral Sclerosis (ALS), Alzheimer’s Disease, Cancer, Chronic Obstructive Pulmonary Disease (COPD), Congestive Heart Failure, Delirium, Diabetes, Leukemia, Lewy Body Dementia, Parkinson’s Disease, Pressure Ulcers, Pneumonia, Stroke, Swallowing Problems and Unintended Weight Loss. I manage patients with complicated nutritional needs including TPN and PEG feedings as well as those on long-term mechanical ventilation in the home setting.